Players who like zombies and cartoons will probably enjoy Zombie Hoard. Microgaming’s newest online slot, released in January 2019, takes a childlike look at zombies. Its impressive 3D graphics are enough to catch most players’ attention. Even though zombies are generally associated with horror, in this game they are amusing. The cartoon graphics make it nearly impossible for this to be a scary zombie game. Though there are four different zombie symbols on the reels, each is cute in his own way. Joining them on the reels are human brains and the Zombie Hoard logo. The game logo serves as the wild symbol while the human brains are the scatter. While three or more human brains on the reels triggers free spins, it’s not the only way to. Players can also get free spins when they accumulate at least 30 tokens. The game’s standard symbols help players earn tokens for free spins. Tokens will accumulate round after round when players win. The luckiest players will collect enough tokens to get 34 spins for free. When the game’s logo becomes a stacked wild, more free spins are won. Players enjoy extra features in this instance. An advantage during paid spins is the wild can be a super stacked wild added to reels three and four. Any winnings achieved when this happens are doubled. 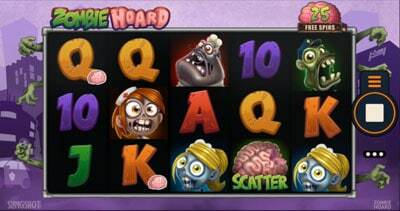 Microgaming has released other zombie themed slots. Since others were released closer to Halloween they were scarier. Zombie Hoard is meant for tamer players who are more into excitement than horror. It isn’t scary enough to offend anyone, but still captures the zombie theme well. The cartoon graphics may make the game appealing to those not necessarily interested in zombies. Its lighthearted style makes it perfect for players of all ages. Even those with little to no slot machine experience can easily understand this game. Anyone can play Zombie Hoard whenever they want. The game can be accessed on most mobile devices. Regardless of what one uses to play it, the graphics are equally impressive. This is likely to help make the game a huge hit. So, is it worth playing? It has many other mobile games to compete with. How successful it becomes depends a lot on how players perceive the game. Some players may be turned off by the fact that it isn’t scary. Others may appreciate it because it isn’t. Zombie Hoard may end up competing with Microgaming’s other zombie themed games. Though its graphics make it appealing, the lack of bonus rounds could turn players off. 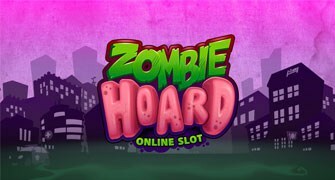 Microgaming usually packs its slots full of bonuses, so Zombie Hoard is a bit unusual. However, the high quality of the game makes it a typical Microgaming title. The visual appeal of the game is enough to catch the eyes of many players. This is just one of the game’s selling points. Another is the fact that free spins can be triggered in two different ways, adding a new twist to the slot.